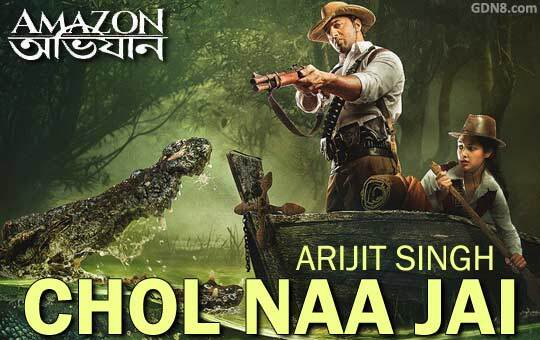 Chol Naa Jai Lyrics from Amazon Obhijaan Bengali Movie The song is sung by Arijit Singh Music composed by Indraadip Das Gupta Starring: Dev, Labani sarkar, Tamal Ray Chowdhury, David James and Svetlana Gulokava Directed by Kamaleswar Mukherjee. Se shob pothe cholte kojon pare..
Raatri hok aleya jalbo niruddeshe..
Tui chand hoye aaj jhapre por..
Keu jaane na kon dik.. oo..
News about Chol Naa Jai Song from Amazon Obhijaan: Great news for all "Arijit Singh" lovers, He is come with his brand new song Chol Na Jai. Dev is the starring Main Lead Role In This Movie. Amazon Obhijaan Biggest Bengali adventure drama film of the year is set to release this Christmas which is sequel to 2013 film Chander Pahar.